Mariga's thunderbolt may have stolen the moment but all fans concur that Jamal Mohammed's introduction during Kenya vs Angola match was a sure game changer.Malo Malo as he is fondly known by his ardent fans is one of the finest midfielders in East Africa. 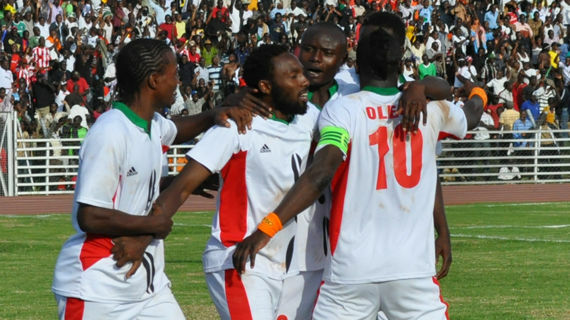 Though he has been out of national team action for sometime before coach Zico recalled him, an excited Jamal says he is happy to be back and secure his second goal to guide Kenya to a crucial victory against Angola at the Nyayo national stadium on Saturday.His first goal was a penalty against Namibia on October 2008 in a game he was voted the man of the match. On Saturday, Jamal scored Kenya’s equalizer five minutes after his introduction after capitalizing on a rebound from a Dennis Oliech's shot. His spectacular ball dribbling skills and intelligent passes left the thousands of fans at the stadium thrilled every time he touched the ball. Speaking after the match, Jamal said he is thrilled to have been a part of Kenya’s victory and looks forward to get more call ups to the squad. “It is good to be back in the team after a long time and more so to score for my country. It is satisfying to all players to play and score for your nation and am proud of myself and my team mates for the victory.” He said. Jamal however cautioned that it is not yet time to celebrate since there is a hard task ahead in securing the African Cup of nations ticket by winning all the remaining matches. “We are upbeat about our next game and we shall concentrate on making sure we rectify the mistakes we made in the first half to be able to win the matches Inshaallah. We started the game a bit tensed up because of the pressure but we regained our footing in the second half and the result is there to be seen.” He added. After the match, Jamal handed his jersey to two ladies at the stadium and called on more Kenyan girls to come out in large numbers and support Kenyan soccer. And to his fans, you can be sure you haven't seen the best of Malo Malo yet.